When Ray Pieper talks about creation, he illustrates a certain wonder, humility and vulnerability before it. He feels the same way about seeds sprouting, birds migrating and flowers blooming. Farming, he said, gives him an intimate perspective. “Creation is everywhere. God just takes care of it, some way, somehow,” he said. 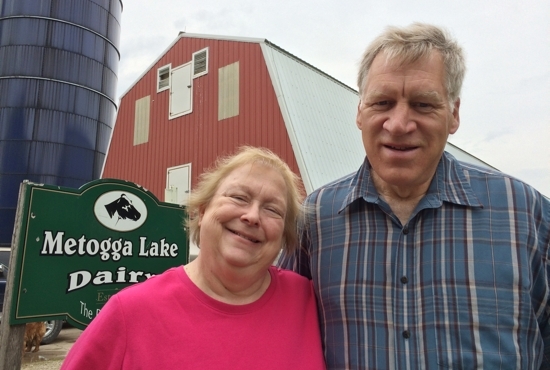 Ray and his wife, Bridget, and six of their 10 adult children run Metogga Lake Dairy farm, located six miles west of Lonsdale and nine miles southeast of New Prague. Parishioners of Most Holy Trinity in nearby Veseli, the Piepers are hosts of this year’s Rural Life Sunday, sponsored by the Archdiocese of St. Paul and Minneapolis. Seated at a long wooden table in their kitchen, the Piepers described the rhythm of daily life on a dairy farm. Milking begins shortly after 4 a.m. and lasts until 10 a.m. Late morning and early afternoon are for other chores: cleaning the barns, planting and harvesting crops, tending to machinery and repairs. At 4 p.m., the Piepers return to the barns for the evening milking, finishing around 9:30 p.m.
Ray grew up on a dairy farm near Jordan, but a dairy farm of their own was Bridget’s idea, he said. She grew up in Bloomington before moving to Jordan as a teenager and dreamed of owning a dairy farm. The couple purchased their farm shortly before they were married at Most Holy Trinity. What started as a small operation now has 880 Holsteins; about 400 are milked daily. Their milk is trucked to a creamery and sold by St. Paul-based Land O’Lakes. They regularly win awards for low somatic cell counts, an indicator of quality milk and their cows’ good health. Last year, their cows produced about 1.23 million gallons of milk. Both Ray and Bridget are semi-retired; their children share the responsibility for most of the farm’s daily operations. All of their children — who range in age from 40 to 19 — are farmers or are studying agriculture-related fields. Did they encourage their kids to farm? “We didn’t discourage them, but we don’t know what we did that they all want to be involved in farming somehow,” said Bridget, 62. Rural Life Sunday has been celebrated annually in the archdiocese for more than five decades, and is designed to bring people together for prayer and to celebrate the blessings of the rural life and special culture of rural Catholics, said Dale Hennen, a member of the archdiocese’s parish services team. This year’s Rural Life Sunday Mass will be followed by food, music, kids’ games and visits to the cows. From the time between planting and harvest, Mass at Most Holy Trinity includes an annual prayer for farmers’ success, Father Lapensky said. The Church has long honored relationship between creation and the farmer, one that received new emphasis with the release of Pope Francis’ encyclical on ecology. For Ray, that connection between faith and farming has been expressed in raising his children well. He sees farming as a way to model responsibility, cooperation and hard work. Watching his adult children work together gives him deep satisfaction. In the Piepers’ kitchen, a portrait of St. Therese of Lisieux hangs next to prints of Holsteins and farm-related awards. Bridget insisted on decorating with devotional and farm art, she said — that, and naming their kids after saints.